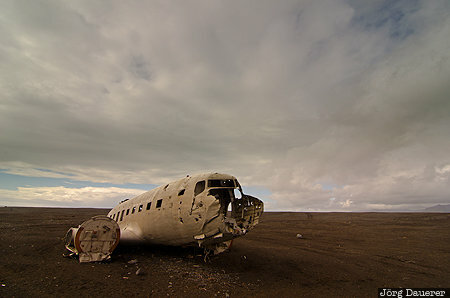 The wreck of a Douglas C 117-D on lava sand below a cloudy sky. The US navy plane had to emergency land at the coast near Sólheimasandur in 1973. Sólheimasandur is near Vík í Mýrdal in Suðurland, Iceland. This photo was taken at noon on a cloudy day in September of 2013. This photo is part of the exhibition Rust, Wrecks and Ruins (February 2014). This photo was taken with a digital camera.